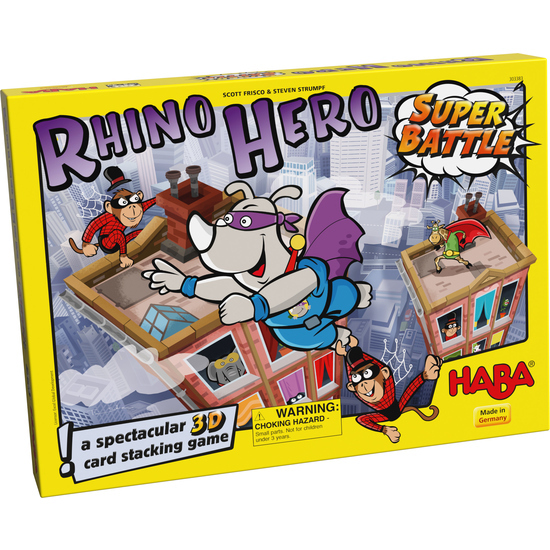 Rhino Hero and his super hero friends have all sorts of adventures on the card skyscraper. But be careful: it gets higher and more wobbly as more cards are used to build walls and floors. Players who have luck with the dice move their own super hero high up, and defend their spot against other players in dice battles ... if only there weren't the spider monkeys who make the skyscraper sway. Contents: 1 game board (3 square pieces, printed on both sides), 30 floors, 24 short walls, 24 tall walls, 3 dice (red/blue/light blue), 4 spider monkeys, 4 superheroes (Rhino Hero, Giraffe Boy, Big E. and Batguin), 1 superhero medal, 1 set of instructions.